It’s surprising how often I can still walk into a store, restaurant or coffee shop these days and find that I am unable to get connected to WiFi. Believe me, if your business is the one in the area offering a free WiFi connection to shoppers and others, you’ll stand out in a way consumers will remember. You see it daily in busy commercial and business areas, people walking around staring down at their phones, trying to find a network that will get them up and connected. So think of it as a digital billboard. Sure, some of these people won’t necessarily make a purchase when they show up, but getting people in the door is half the battle – and being the business that offers fast, reliable WiFi is a great way to gain attention. If you offer WiFi that is fast, secure, and reliable, you’re putting yourself in a position to succeed. How many times have you settled down to work somewhere only to find out that the connection is weak or spotty? It’s something you remember. The fact of the matter is that you don’t want to skimp on the connection you offer consumers because it represents your brand—and you want to project quality and reliability. According to a Small Business Trends report, as many as 62% of businesses noted that customers spent more time on their premises once WiFi was offered. It’s a pretty simple equation, and more time in your business means more opportunity to make a sale. Even if it’s just a polite purchase to justify sticking around, it’s still a purchase that wouldn’t have happened without offering connectivity. For some businesses, customers sticking around for too long can turn into a problem. If that’s the case for you, you can still use WiFi to attract customers, but configure it so that there’s some sort of time limit before a user gets kicked off. This is a great way to bring in new customers but defend against cyber-squatting. When it comes down to it, when a business offers solid value to customers they’re very likely to return the favor. Being a place where someone feels welcome and invited to get comfortable has immeasurable value, and often that is reason enough to make a purchase. Half of all small businesses surveyed by Business Insider found that customers spent more money when free WiFi is available. Another common problem that happens with small businesses has to do with price comparisons. The truth is that we’re all struggling to keep up with what’s out there online. Between big box stores and Amazon, it can seem genuinely impossible to beat out the prices that are out there. The problem is that it’s not a case of “what customers don’t know won’t hurt them.” Not being able to look up that price comparison is simply, more often than not, going to result in someone leaving the store without buying anything. The thing to understand is that even though someone could easily just hop on Amazon from their home, and order what they want – they’re in your store for a reason. Pictures may say a thousand words, but sometimes they aren’t everything. If you can’t handle and touch the item, in many instances, you don’t really know what you’re purchasing. You also probably want access to valuable reviews that will answer any questions you may have about how something holds up long-term. One of the biggest things that some business owners overlook is the sheer value of getting people in the door. Even if they don’t necessarily make a purchase, it means that you’re on their radar, which means that you stand a chance to make a sale at some point in the future. The problem is that not everyone who walks into your business is going to give you their email address. Competition is something all small business must face, and identifying simple things you can do to stand out and create a competitive advantage can have a big impact on your bottom line. If you’re trying to think of what you can offer to really make your business attract attention, take a look at fast, free, secure WiFi. Having a reputation for great WiFi gives people a reason to come to your business year round. Offering WiFi means that customers will spend more time at your business, which can give you a better opportunity to make a sale. Having WiFi boosts customer spending. 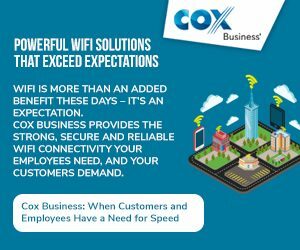 For questions about Cox Business products and services contact us.